Ericka, a regional director, recently contacted me for training on how to create a respectful work culture. She took a promotion from manager to director six months ago and inherited a team culture of infighting, bullying, and intimidation. Not a happy bunch. “The previous director played favorites and tolerated insensitive comments targeting new employees, I won’t tolerate it,” she said. In last month’s blog, we addressed four stages of incivility from the book Trust Your Canary: Every Leader’s Guide to Taming Workplace Incivility by Sharone Bar-David. The stages outline how organizational health deteriorates the longer it tolerates uncivil behaviors such as condescension, exclusion, bullying, and harassment. Today, we’ll address what you can do to stop the spread of incivility in your organization in ways other than needed policies and protocols. Instead this blog will help you draw people to positive behaviors, rather than focus on negative behaviors. This is NOT to say that unacceptable behaviors go unaddressed, rather it’s how they are addressed. Ericka said she tried to address problem behaviors when she spoke with employees and let them know she won’t allow it to continue. “I’ve been very clear I will follow through with consequences from suspension to termination if these behaviors continue, no matter how long the employee has been with the company,” she said. Secondly, she brought in security and union representatives to speak with employees about creating a safe, respectful work environment. Beyond the education about what constitutes a respectful workplace, I invited Ericka to answer the following questions to dramatically improve the retention of healthy behaviors. In her answers, she identified specific ways she can intervene and adapt her current approach to reach the goal of a respectful work culture. What’s already working to promote respectful behaviors? List as many as you can. How can you, as a leader, promote more of what’s working? What are the strengths that keep your culture from dropping below a three on the scale? What is the first thing that would indicate a turnaround in your work culture? What limitations need to be taken into account to create a respectful work culture? What will you, as a leader, do differently to promote a respectful work culture? How will you create repetition of and reinforce positive behaviors? What is the most important thing to remember if employees slip back into uncivil behaviors? If you don’t protect the well-being of your work culture, what’s likely to happen? What makes you resolute to create a respectful work culture? These questions help you define a clear roadmap to construct unique and effective solutions that promote a respectful, civil work culture. My experience as both a family therapist and Corporate Culture Consultant have taught me that focus on company values and positive behaviors creates a lasting culture effect. Use the questions to map out behaviors you want to define your culture, focus on strengths, and follow through with consequences when expectations aren’t met. When you do, you will remedy the spread of incivility in your organization. 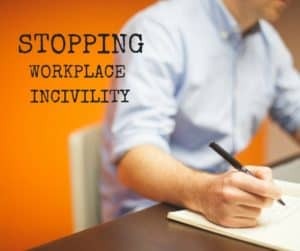 If you’re ready to turn around incivility in your work culture, let’s talk. Together we’ll develop a system and process so every employee knows expected behaviors and contributes to a civil and respectful work culture. Bonnie Artman Fox works with committed senior leaders who want to create work cultures that bring out the best in their employees. From over 25 years in the healthcare and psychology fields, Bonnie specializes in behavior change that drives organizational health and performance. Click here to learn more or bring Bonnie to your company.